Also: it’s a really fantastic salad, which means I hope we can find room on this site for one more caesar salad. This one is epic. Maybe it’s not what you make on a Monday night, maybe it’s not the one you make for people worried about egg yolks and salty brined fish, but now that those people are out of the room, you’re going to be glad you don’t have to share. This, to me, is the definition of an updated classic, wherein a few tweaks makes what we’re used to even better. 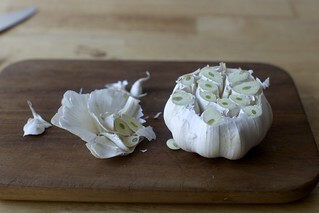 Tweak 1: Roasted garlic, which is creamy and delightful here. Tweak 2: Spicy candied walnuts (but you can use whatever nut you like here; Team Walnut is a lonely place, sigh) instead of the usual heaviness — or at least disappointment — of croutons. The flavor profile is different, of course, but they have such a great contrast here, plus, they’re pure Reluctant Preschooler bait. Tweak 3: Pecorino — saltier, funkier — instead of parmesan. Tweak 4: A little more subtle, but not all classic caesar salads have vinegar but this one uses a little white wine vinegar and a little sherry vinegar for extra gravitas. It harmonizes well with the roasted garlic. It makes a lot of dressing, but we used every drop of it over the next week, when we made this salad again and again. Make it for yourself as weekend treat, or make it mid-next week and stash it in the fridge for a really great Thanksgiving salad. The salad may look austere, but nothing breaks up the heaviness of casseroles and gratins and stuffing and gravy like a crispy, green, and complex salad. You’ll have extra dressing (it makes 1 1/2 to 1 2/3 cups) and extra walnuts (it makes about 2 1/4 cups). The dressing keeps for one week in the fridge. The walnuts will keep easily 2 weeks in a jar at room temperature. To make the roasted garlic dressing: Heat your oven to 350°F. 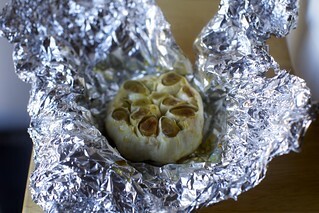 Cut a quarter inch off the head of garlic and place the head, cut side up, on a big square of aluminum foil. Drizzle lightly with olive oil. Wrap it tightly in the foil and bake for a little less than 1 hour. Remove the garlic from the oven and let it cool in the foil. Squeeze the roasted garlic out of 4 or 5 cloves and set the rest aside for another use (“its really good just spread on grilled bread,” the book tells us). Leave the oven on for the walnuts. Put the roasted garlic, the raw clove of garlic, mustard, vinegars, egg yolks, anchovies, and lemon juice into a blender or food processor and blend for 30 seconds or until combined. 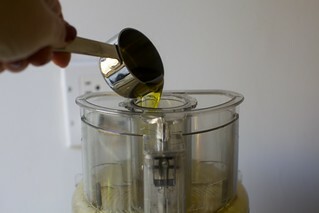 With the machine one, add the olive oil in a slow, thin stream until it’s incorporated and the dressing looks smooth. Taste and add salt, pepper, and more lemon juice as desired. 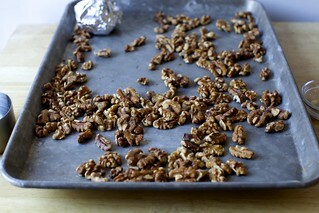 Meanwhile, make the walnuts: Put the nuts on a baking sheet and toast 8 minutes, turing your baking sheet and tossing the nuts around halfway through.Remove them from the oven and let them cool. Turn the oven down to 275°F. Cover a large baking sheet with foil and (do what I didn’t do), coat the foil with nonstick cooking spray. In a large bowl, whisk the egg whites until they begin to have body but not until they form soft peaks. 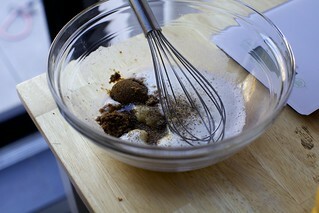 Add the brown sugar, honey, and about 10 turns of a pepper grinder’s worth of black pepper to the whites, and combine. 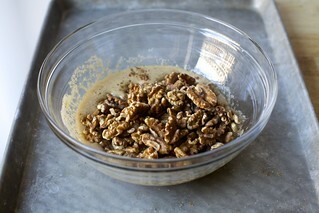 Add the walnuts to the mixture and mix until they’re all well coated. Spread them on the prepared baking sheet and sprinkle them evenly with the salt. Bake for about 24 minutes, turning the baking sheet about halfway through. The nuts should be dry and not sticky. Remove them from the oven and let them cool. To assemble: Place the romaine leaves in a large bowl. Pour about 1/4 cup roasted garlic dressing over the leaves, using your fingers to toss and coat the leaves evenly. (The book warns that tongs will damage the leaves here, and won’t distribute the dressing as easily.) Use the remaining tablespoon or so if needed, to taste (Romaine hearts vary a lot in size). Divide the lettuce between two plates. Grate the Pecorino over each plate. Scatter the walnuts over the two plates and give each a grind of black pepper. Eat with a knife and fork, blissfully. Thanks for a recipe that uses the same amount of egg whites and yolks. A personal pet peeve. Also it sounds wonderful yummy! Does he eat Worcestershire? (It has anchovies in it but not everyone fusses over this.) If he does, you should make my other, less authentic, caesar dressing I mention. you could also try a vegetarian worcestershire sauce. Annie’s brand makes a vegan Worcestershire sauce that’s good! I bought it because I couldn’t find my usual brand and I can’t tell a difference between Annie’s and the non-vegan stuff. Is there a good substitute for the Dijon mustard in dressing if I wanted to make dressing gluten free? Wow, I had no idea that dijon had gluten in it! Regardless, there’s a lot of flavor in the dressing and I think if you omit one ingredient, it can still taste good. There are several brands of gluten free dijon mustard- just look around in your grocery store. (This is coming from someone with celiac who has gf dijon in her fridge right now- I just can’t recall the brand- it’s a common inexpensive one though). Toss in some powdered mustard! Just a fine dust made from mustard seeds and it’s amazing in dressings. Organicville makes GF dijon mustard. I believe all of their mustards and salad dressings are GF. Could you substitute anchovy paste for the anchovy fillets? And if so, what would the proportions be? I bought anchovy paste recently for a recipe, and I’m looking for other ways to use it. Thanks! I came here to ask the same question. Anchovy paste is easy to find here, fillets — not so much. I haven’t weighed them but cannot imagine the filets are more than 15-20 grams each. You can also add it to taste. Depending on brands/taste, we start with 1/2 tsp/filet up to 1 tsp/filet. I have a vegetarian family member and I make caesar dressing with capers. Sub 1 and half tablespoons (rinsed capers) for every 6 anchovies. Hi, Deb – what kind of anchovies do you use, fancy or not fancy? Any specific ones to recommend? I’ve gotten Italian salt-packed ones that turn to mush, and hold the Ortiz ones in high-esteem. But how fancy should one go for this dressing? Not fancy, and no real preference but I’m not a heavy user of them so I grab whatever the store has in a jar (so I can reseal it). If you have a favorite, use it. If they’re fancy and maybe their nuance will be lost in a salad dressing, I’d say step it down a little. Deb, you list Dijon twice; is this a mistake, or are you actually using two types here? Recipe sounds delicious and may well make its way to my Thanksgiving menu. As always, thanks for the inspiration! No, it’s a typo, now fixed, thanks. How long will the dressing last in the fridge? I suggest a week in the headnotes. This one bugs me, sorry. Yum! This looks delicious. Love the idea of using nuts for crunch – my housemate makes a ceasar with walnuts (and blueberries) that is insanely good. The tangy, bursting berries and the meaty crunch of walnuts play so well with ceasar! Thanks for sharing! Can’t wait to try it. I always find it ironic that parents usually get given the healthy good stuff like salads, cheeses and antipasto plates at parties while kids get their pick of pizza, sausage rolls and junk food. This sounds lovely, but I wish you’d just give amounts for lemon juice–your recipes always have this “juice of half a lemon” or “juice of a lemon” or whatever, and I know you want to encourage people to use the Real Thing, but it would be nice to know how much juice we’re really talking about. (And I did a blind taste test awhile back and honestly couldn’t tell the difference between the fresh and the bottled.) So how many tablespoons is it? ALSO, I read and loved your NYT article on bake sales this past weekend, and the link to my blog post that mentions it is below. Thanks. I have absolutely no patience to measure lemon juice in spoonfuls, definitely a recipe pet peeve. That said, I get 2T per lemon half on average. very helpful–thanks. I usually microwave the lemon juice and the egg or egg yolks just long enough to get the mixture up to 160 when I make dressing–more for my own peace of mind than any real danger. 20-30 seconds on high, whisk immediately. When a 9 year old says a salad is delicious, you better believe I’m going to try it out! I’ve never made Cesar’s dressing but, thanks to you, I’m about to. Team Walnut from way back! I’m, when did you get a nine year old?! He was just born! Ps I made it: the dressing is incredible! I added cayenne and cinnamon to the nuts, and put extra anchovies, avocado and a poached egg on it. Heaven! Please tell me where on the UES of Manhattan you find the best produce. I have bought organic and non-organic at every store and find that from lemons to lettuce it is all poor quality. Do I have to shop at greenmarkets to find the quality in your pix? I’m making this right away! What a great use for roasted garlic! I had some previously made sugar and spice candied nuts in the cupboard which I subbed in. The dressing was rich, creamy and amazing! The fresh eggs elevated the texture from a regular Ceasar dressing. It need a touch more olive oil as I found it a bit sour. Another great recipe! I have read the comments below, and noted that Debi Simon said you can microwave the egg yolks and lemon juice for 20-30 seconds to make sure it is safe. But it is really ok to leave/use a dressing with the uncooked egg yolks for a few days, and still use ? I’ve routinely left cookie doughs in the fridge for several days before I get around to baking the whole batch, and it’s always been fine. The times I’ve made fresh mayonnaise (with raw egg yolk) and have left it for too long in the fridge, it’s been easy to tell that it went off–it didn’t smell or taste right, by a long shot. All of which is to say, when I make this recipe for Thanksgiving (thank you, Deb!) I’m totally going to make a giant batch of dressing and figure that my family and I will eat it up over the course of several days. Do you think I can make it with Worcestershire sauce or something similar instead of anchovies if I can’t have them? Thanks! You’re my go to when I need new recipes in my rotation! Can you tell me about how long the dressing would last in the fridge? Just curious what you’d guess since it has the egg in it. Thanks for being you! This one looks simple yet delicious! I’m craving for a caesar salad now. Making this now, my walnuts seem to be sticky, I have had them in the oven now for almost an hour…before I put them in the oven they looked really saucy, so I added more walnuts, I’m looking at the pics you posted, and mine look similar, do they dry up a little as they cool? Oh god this sounds amazing, but it’s also torture for me – I’m a massage therapist so this much garlic is a no-no unless I have some time off. Honestly though, I suspect it’s worth taking a holiday for this salad. Some people go skiing or to a beach town, I have a garlic free for all. Yum. I’m celiac so I appreciate there are no croutons. 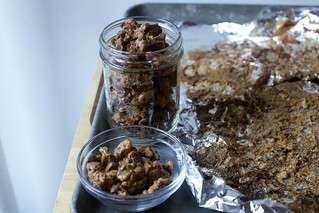 Candied walnuts, what a great idea Deb, thank you! The French dijon mustard Maille is gluten-free, most dijon mustards are. This sounds so yummy because I love both garlic and walnuts :) And still a little different and some “twist”, I’m going to try this soon! Thank you for sharing this! Wow! I have made tons of different homemade caesar salad dressings over the years and this is outstanding! YUM! This sounds amazing! I love the whole twist on a classic, if something’s delicious it’s always good to have a few versions to go with so you don’t wear one of them out. This is straight up delicious! I loved every bite of it and look forward to eating salads the next few days! For those wondering about substituting anchovy paste, I subbed 5 tsp of anchovy paste for the anchovies and, like I said, the dressing was delicious. I may try less next time. The only issue I had was my walnuts never got quite dry in the oven. I baked them for twice the amount of time then gave up and pulled them out of the oven to let them dry on the counter. I’d love to make this salad for family over Thanksgiving, but my very much loved daughter-in-law is allergic to walnuts. What, if any, other nut would you suggest as a substitute? any nut that you like? Pecans probably would be good. Candied pecans are great in salads – I like tossing them into my kale salad. Recently you mentioned the mandoline you use and the next one you were going to get. Which one do you recommend? Thanks for your help. Benriner are great! I have one with a ceramic blade that I love. With all the complex salads and etc out there, I LOVE a simple straightforward salad. Thank you! 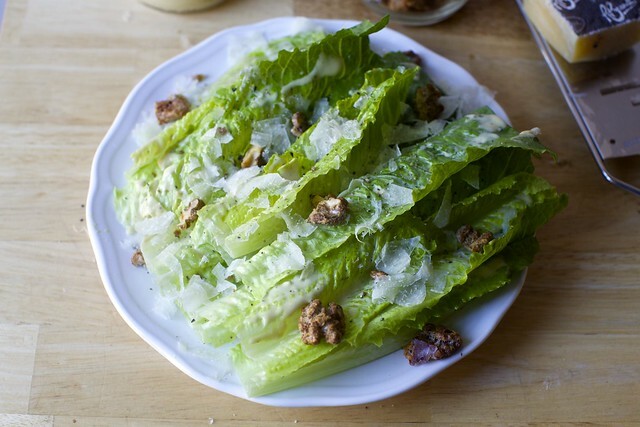 Also, have you ever tried seared romaine halves as a winter side dish? They are surprisingly great! We drizzle a bit of vinaigrette over them and love it! I enjoyed this salad, as a person who generally dislikes raw salads. I’ve eaten it 3 days straight! A couple of notes, like Carly, I also had issues with my walnuts drying. I kept them baking in the oven for close to 40 min to get them closer to dried but they were still quite sticky. Chewing them, I felt like I had candy stuck in my teeth rather than what I imagine they should be – light, crisp, and slightly crunchy. It helped to stir them up halfway through. Normally, I like recipes that use up the full egg, but in this case I think 2 egg whites were probably unnecessary and I might save one for other cooking. The dressing was definitely more involved than the standard Caesar on this site but since it keeps well for so long, I’d do it again. I tried the salad the first night with regular Parmesan (good) and then pecorino the next. The pecorino is worth it, it really plays well with the candied walnuts and dressing. I’m so happy I’ve found your site. The garlic dressing sounds incredible. Booking marking this so I can make this for dinner later tonight :). Yum, I can’t wait to make this!! Making this right now and the dressing is so yummy! After 30 mins of baking my walnuts are not sticky to the touch, but they are quite fluffy. Is this the aim here? Replying to myself… the nuts around the outside were definitely done and (what I assume is) the proper texture. The ones in the middle were still sticky under the surface (where it was dry but fluffy). Next time I will probably scoop the nuts out of the egg blend with a strainer when I put them on the baking sheet. There will definitely be a next time, because this salad was DELICIOUS regardless of the nut issue! I made this for a dinner party last weekend and it was really delicious. The dressing- OH THE DRESSING, was divine. It was super garlicy and addictive, loved it. I was less than impressed with my walnuts, though. I’m wondering if maybe they needed like 5 more minutes in the oven. They were kind of sticky, not dried out at all. Do you create these recipes yourself? They look amazing! I’ve been trying to make this, and it’s… not working for me? The dressing had so little flavor, so I’m trying again with maybe fresher garlic, because I can’t figure this out! I’ve made the spiced nuts twice and they didn’t work either time. The egg made kind of a frothy mess around them and it baked almost like a pie filling in parts…. I’m going to try one more time with no extra liquid around the nuts when I cook them to see if it helps. Help appreciated! SK has NEVER steered me wrong before and this sounds SO GOOD!! Yum to all but especially the dressing! I did mess with the method for the dressing. 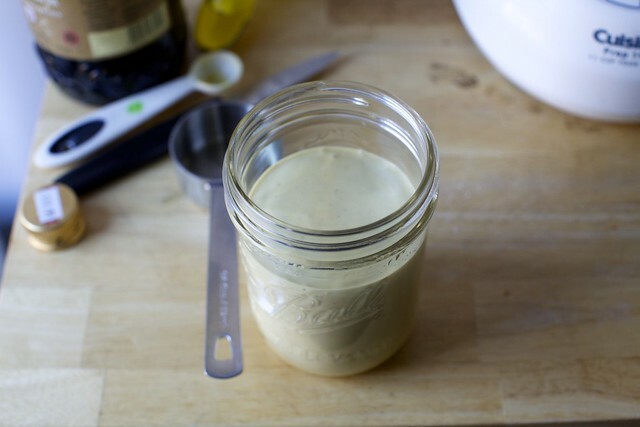 I often make homemade mayo: similar ingredients except for roast garlic and less vinegar. I make it in a pint mason jar with an immersion blender: all ingredients except oil, then oil and let everything settle. Start blender slowly until you see it emulsifying then blend – tons of youtube videos out there demo this. So I made the dressing the same way. 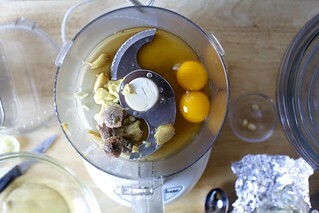 When I make mayo, I often use 1 whole egg vs 2 yolks and that works fine also. And since I didn’t really like this method of making the candied nuts, I would not hesitate to try this with 1 whole egg if I didn’t have plans for egg whites. The nuts – worked ok and taste was fine but I’ve made candied nuts in a skillet with good results and easier. Granted butter instead of egg whites for the fat but not a LOT of butter so that is my preferred method over the egg white process. Otherwise, great combination of flavors – dressing is wonderful!! I made this a 2nd time and in between came across a similar recipe for the candied nuts that uses half as many egg whites. I had better results. So, for me the ratio of 1 egg white to 2 cups of nuts works best. Also, I did not toast the nuts – raw nuts into the egg whites, bake same time, but I turned every 10 minutes and then kept a close eye on those last 4 minutes. I could smell them almost starting to burn about the 3 min mark so took them out and let them cool for 2 hours. Then “break up” and I thought they were perfect. Oh, I also melted 3 T butter in the pan before adding the egg white, sugar-spice mix. 3T butter for 2 cups nuts and 1 egg white. I am sorry, this sauce didn’t quite match up with a recipe I have adapted over the years from Bon Appetit! This sauce is good …but mine (in my humble opinion) is better! It literally came down to personal preference. I also had problems with the walnuts. There was way too much liquid on the nuts and they ended up swimming in the sauce …unfortunately, I had to chuck them! I wish I had read the comments first about scooping the walnuts out of the mixture before cooking. They might have turned out better! :( One thing I will take from this recipe was the roasted/fresh garlic mixture. I might try that on my next batch of Caesar Salad. I also liked the addition of walnuts instead of (boring/same ol’ same ol’) crutons. TEAM WALNUT ALL THE WAY! Hi there – hoping you may have time to respond. Can you re-link the nice white rectangular serving dishes you use that you gave on Instagram? I love your stories but they go by too FAST! I tried to find elsewhere before pestering you but could not. Happy Thanksgiving from a huge fan. How would you adjust the dressing and walnuts amounts if making this salad for 7-8 people? Hoping to make this for Thanksgiving! If it’s on the table with a lot of other things, you might be fine just doubling the lettuce. No need to scale up the dressing (you’ll have plenty) or the walnuts (unless you want them for snacking, which, I think you will). I was SO EXCITED to make this. And then there was a massive recall on all romaine lettuce everywhere. What to do? I converted this into pasta! So, it was a little weird, but it worked. I threw in the whole head of roasted garlic because when I decided this would be pasta, we sort of chucked the rules. I tossed hot pasta with about half of the dressing, and then stirring constantly (cacio e pepe style) gradually tossed in about 1/2 cup pecorino. Put the nuts on top. The nuts were in a little bit of a mess, like others mentioned, but I just picked them out and ate them anyway. The leftover nuts are going on my yogurt tomorrow for breakfast! I hope to make this again when there isn’t a massive romaine lettuce recall. Wish I’d read the comments, my bits are also mush and taking way longer than expected. Glad I made backup croutons not knowing what we’d want. Dressing is delicious though! NOTE: TOTAL RECALL US AND CANADA ON ROMAINE. E COLI. THROW OUT WHAT YOU HAVE. This Salad looks great, wish romaine were a more popular choice these recent days. Though its look, Its very nutritious. I’ll defiantly try this at home. Thanks. Just wanted to stop by and say how show-stopping this photo is! Just made the dressing tonight – I love anchovies but felt that 3 was enough. Since there was a recall on romaine I went with what I could find at Trader Joe’s that could stand up to the dressing. Baby kale and cucumbers were perfect! It’s a bit thinner than I expected but the flavor is great. Anything with roasted garlic is bound to be a winner. Finally made this with the walnuts tonight! They’re realllly good, well worth the minimal effort (honestly if you’re already putting the two egg yolks into the dressing you might as well use the egg whites for the nuts – I also forget about them in the fridge otherwise and they go to waste). I made sure to spread them out and had the oven around 300-325 degrees (I had other stuff in there and couldn’t turn it down), and it actually turned out perfectly after about 20-25 mins. I also have an oven thermometer so my temps are pretty precise; I would wonder if the people who had issues with sticky/wet walnuts maybe were under the recommended temp? Or 275 just isn’t hot enough. Sort of wondering why you have published a Caesar Salad recipe and kept it up on your website since the nationwide U.S. and Canada recall of romaine lettuce (only lifted a couple of days ago for some growers) !!! Romaine recalls come and go (I can think of several in the last decade); no reason to delete every perfectly good recipe on this site with romaine because of a temporary recall. Other lettuces can be used instead. Would also like to point out that not all Deb’s readers live in North America. This ex-pat is very thankful that Deb did not wait to post this until after the romaine recall was over in the states, because it was a delicious addition to my Thanksgiving table in Sweden. Is there an anchovy substitution that I could use without ruining this salad? Don’t eat fish of any kind. I like salted capers as an anchovy substitute. It’s not the same but it closer than most substitutes. I didn’t see the note about the walnuts in the comments section. Way too much liquid and not enough time and/or temp. I made this for my family’s Christmas Eve dinner. Everyone loved it! I made this for lunch today and couldn’t get enough. My partner is vegetarian and never had a ceasar before and he swooned. Over salad. I replaced the anchovies with a couple of tablespoons of vegetarian Worchester sauce (I found a dusty bottle at my local natural food shop) and it came out amazing despite the fact I managed to get quite a bit in my hair and painted on the wall (no food processor so I whipped it by hand). I thought I had white vinegar and sherry vinegar in my cupboard, but it turns out that I didn’t. :( I didnt have time to go to the store, so I substituted with apple cider vinegar and red wine vinegar. I’m not sure how it compares with the recipe as written, but still so good I want to eat it daily. I was feeling too lazy to break out the blender, but I threw a head of garlic in while I was roasting some veggies (400 degrees for 30 minutes) and mashed it into the SK Every Day caesar dressing–I can highly recommend that for a lazy, raw-egg-free version! It adds some great nuance to the dressing without adding much work.